September 2017, in Hong Kong. I am so happy that I can finally write about a South African wine! Seriously, it’s hard to find a good opportunity to try across range. Maybe you can find an odd bottled that is hideously marked up but otherwise there are little options to be found. Recently I got to meet Lisha and Petrus de Villiers of Nelson Estate, a family winery that is based in Paarl. Paarl is the second oldest winemaking region in South Africa after Constantia. Founder Alan Nelson (and Lisha’s father) first found the estate in 1987 and now it is a 130ha estate with a first class winery with event space. Lisha has been the chief winemaker since 2014 with her husband Petrus de Villiers. On their 130ha, they have a smattering of varietals, from Sauvignon Blanc to Shiraz, with a total production that is 180,000 bottles per year but apparently small by South African standards. What was most interesting was learning about the history of the South African winemaking. Prior to the 1980s, all wines were under the coop KWV however after it opened up to small independent private wineries. Sadly due to the economic difficulty of running a vineyard, the number of smaller independent producers have been dropping although larger producers are doing nominally okay. The problem is that margins are thin and quantity is dropping lower due to the drought over the past few years. Drought remains one of the biggest problems that South African wineries face. Although they are allowed to irrigate, it is a moot point if reservoirs remain dry. This can be offset by cooler temperatures (2017, 2018 so far) however the vines struggle under hot vintages such as 2016. Lisha has said although it has greatly reduced her yield, the vines remain healthy and producer better quality grapes. I definitely do think that South Africa as a wine region is woefully underrated however little options are yet available to the everyday consumer. 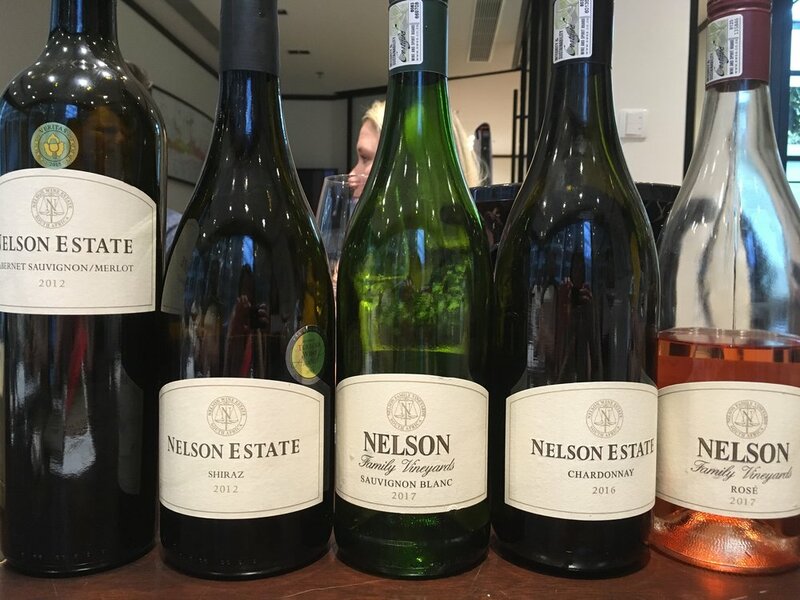 Nelson Estate is available through Corney & Barrow UK and Hong Kong. Sauvignon Blanc 2017: Made with bought in grapes from nearby region Stanford. The nose itself is not very intense or expressive but quite easy to drink on the palate. Light notes of apple, pear and lemon with some floral herbaceous notes. It has fresh acidity but balanced with a weightier mineral quality. Chardonnay 2016: This is made in a more oxidative style with no sulfur. However it is treated with new French oak though surprisingly not as scary as it sounds on the nose and mouth. There is a bit of cream but not too much, with more saline and mineral notes to round things out. The taste is rather distinctive and unique, unlike other Californian or Australian chardonnay available out there. Rose 2017: This is a Nelson Family Vineyard wine, which means the grapes are bought in. The varietals are Syrah and Cabernet Franc. This is made in a very concentrated style so the colour is deep salmon and the mouth feel is quite rich. There is not much on the nose but the palette tastes almost borderline off dry to me. It is nice strawberry and mineral notes but bitter after taste. Shiraz 2012: Honestly this was quite lovely and perhaps my favourite out of the whole line up. There is heavy sorting of bunches and berries. The colours is very deep and rich; the nose is pronounced with lush black fruit and plum. There are some sweet spice characters but not much of the pepperiness that you find from a lot of Shiraz wines (in France or Australia). In the mouth, it isn’t as cloying or as full bodied as you would expect in the nose — it is surprisingly elegant with supple silky tannins. Lovely. Cabernet Sauvignon/Merlot 2012: Surprisingly on the nose and mouth, this was brimming with red fruit characters more than black. The mint is very strong here as well, when you drink the wines there is almost a mustard-like kick to it. It’s quite interesting but compared to the Shiraz this leaves something to be desired. The finish is also short so it’s really a wine you don’t need to think too much about.